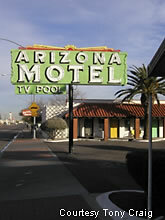 The Arizona Motel still features its roadside sign just off the street. This one lights up. The sign itself dates back to 1939 while the motel was built in 1930. 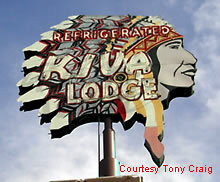 This ornate sign for the Kiva Lodge in Tempe features a colorful headdress. The motor courts themselves feature covered parking next to the individual bungalows, though not sure what type of condition the lodging is here these days. The sign has been around since the late 1940's. 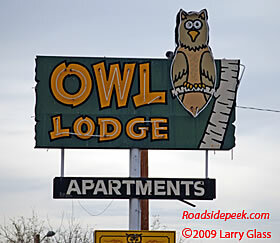 Here's a nice shot of the Owl Lodge off of the main drag in Tucson. The motel dates back to 1955. UPDATE 04/09 : The Owl Lodge in Tucson, AZ has now been turned into apartments, like many of the other old non-chain roadside motels in the area. 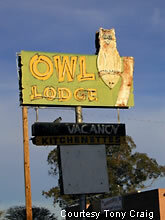 The sign for the Owl Lodge remains and appears to have been recently restored. 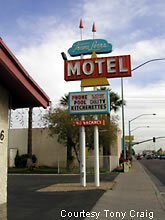 The Travelers Motel in Tempe shows off it sign that appears to be from the 70's or so. 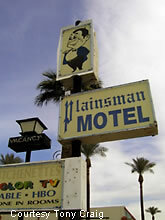 Yet another Mesa motel marquee, the Plainsman Motel sign here looks somewhat similar to the one in Holbrook, AZ.